One pot, no-boil dishes are my favorite! I love how easily they come together and how easy they are to clean up! 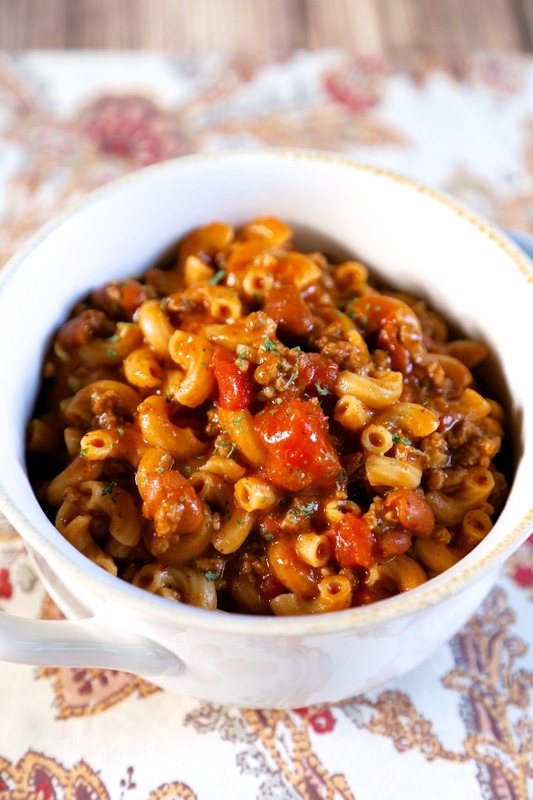 This One Pot Chili Mac is no exception. I browned the meat and then threw everything else in the pot. I let it simmer for about 15 minutes and dinner was ready. I served this with some Texas Toast Cornbread, because chili needs cornbread. 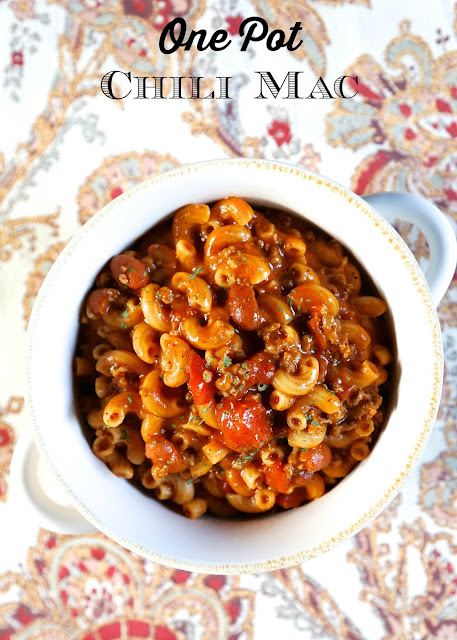 Feel free to top this Chili Mac with your favorite chili toppings - sour cream, cheese, jalapeños, and Fritos. This was SO good. I ate WAY too much of it! It was even good reheated for lunch. This would be a great dish to serve while having friends over to watch football! In a Dutch oven, brown hamburger meat. Drain fat. Add remaining ingredients. Bring to a boil. Cover and simmer 15-18 minutes, stirring occasionally, until pasta is done. I have way to many nights where I have about 20 minutes to get dinner on the table! I cannot tell you how happy this dish makes me! This looks really good. Thanks for the quick, week-night recipe. Super quick question... did you mince the garlic cloves, or just let them cook in there whole for the flavor? Maureen - I minced them. I will fix the ingredients. Thanks! My list just keeps getting longer and longer of recipes I need to try of yours!! This looks like it's going on the top of the list!! I LOVE your one pot 'no boil' recipes! Can't wait to try this one! I'm a cooking newbie... elaborate on browning hamburger in a Dutch Oven, please. I made this last night and it was fantastic! And it was even better that there was only one pan to wash. It's a definite keeper and I'm adding it to our rotation. Do you simmer everything with the cheese, or do you add that in after? Delicious! Simple and quick, yet fantastic! Garnished with a little extra cheese on top. Served it up with a garden salad for an easy weeknight supper. Kids loved it as did hubby! Win win!